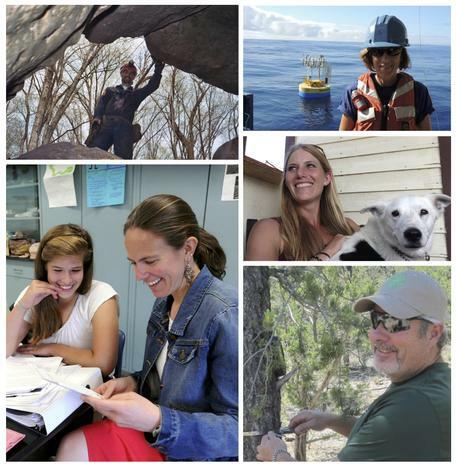 Outstanding Earth Science Teacher (OEST) awards are given for "exceptional contributions to the stimulation of interest in the Earth Sciences at the pre-college level." Any teacher or other K-12 educator who covers a significant amount of earth science content with their students is eligible. Ten national finalists are selected, one from each NAGT regional section. Some sections also recognize state winners. Individuals may apply themselves or nominate a colleague for the award. Via active statewide and sectional programs, build a solid state, regional, and national liaison with administrators of pre-college earth science education. $700 travel funds to a GSA meeting from GSA, which could be used to attend a GSA Annual or Section meeting. There are also a variety of awards for state winners, section runners-up, and honorable mentions. Read bios for the 2018 Section and State Winners. OEST State and Section winners are strongly encouraged to take an active role in NAGT, NESTA, and all other organizations that support the OEST Award Program. Read bios for the 2017 Section and State Winners. Read bios for the 2016 Section and State Winners. Read bios for the 2015 Section and State Winners. Read bios for the 2014 Section and State Winners. Read bios for the 2013 Sectional and State Winners. To nominate a teacher for this award, please complete the online nomination form. You can find information on which section you live in by checking out the Sections Page. Nominations may be submitted at any time during the year but nomination deadlines for the current year vary by section. If a deadline isn't listed beside your section above, check with the listed representative for your section to find out when your deadline is.